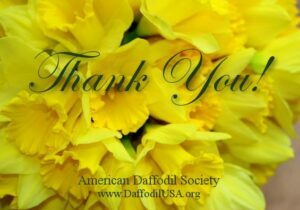 Another outstanding W/Y daffodil from Oakwood Daffodils/John Reed. Oakwood’s “Hermann”, named for the town the 2016 World Convention will visit during the Haeffner farm tour. John Reed’s seedling dubbed “Somethin’ Else” ! So much color! Oakwood Daffodil/John Reed’s “White Lantern” Beautiful!!! Enjoy!!! Robin Hill Trophy — 3 – x – N Z .